Relief efforts for five million people affected by flooding in Sindh province of Pakistan are threatened because of a lack of funds, aid agencies say. Oxfam, Save the Children, Care and the French agency, Acted, have warned that more than nine million people are at risk of disease and malnutrition. The groups warn they may have to curtail their relief operations unless donors provide more money soon. Less than a third of the UN's relief target of $357m has been reached. Correspondents say that while the press statement released by the agencies does not apportion blame, the Pakistani government's overall response to the flooding has in recent months come in for heavy criticism. Neither foreign donors nor the government in Islamabad have commented on the statement, but correspondents say the perception is that for a second year running, the government in particular has failed flood victims. The four aid agencies say that three million Pakistanis still require emergency food assistance and 800,000 remain displaced. Officials in Sindh say that at least four of the province's 22 districts still remain under water. The four agencies say that the lack of funding for flood relief programmes will have serious consequences if money is not found soon to help those in need. 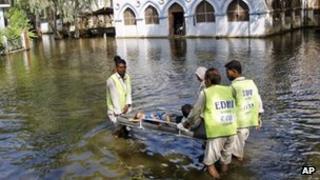 This year's floods in the southern province of Sindh are thought to be worse than last year's deluge and have killed about 250 people. Caused by heavy monsoon rains, the floods have damaged or destroyed some 1.5 million houses in Sindh alone since they began in August, the aid agencies say. Officials have repeatedly expressed fears about the rapid spread of disease, warning that the problems affecting Sindh are getting more acute. Oxfam would be forced to cut back its work after December, meaning the 3.9 million people it planned to reach will now go without help. Save the Children has so far raised only 35% of its global appeal for the Sindh floods. Care faces a shortfall of 91% and is struggling to continue its relief programme. "Care has used its own resources to fund this response, which is focusing on emergency health care and food security," said its Pakistan country director Waleed Rauf. "Due to a funding shortfall, we've only reached roughly 10% of the targeted 150,000 in need of emergency health care in the areas where we and our local partners operate." The programmes of UN agencies also are affected by "sluggish" funding, the statement says. Their $357m (£222m) appeal has received only $96.5m (£60m) so far. "The 2011 floods flash appeal remains distressingly under-funded, with a 73% shortfall, and if more funding is not received relief supplies will run out within weeks," UN spokeswoman Stacey Winston said. She said that this hampers UN agencies striving to provide clean water, sanitation, food, shelter and health care. The four aid agencies have warned that the Pakistani government also faces a funding crisis and might be forced to scale down its relief efforts. "Over two months into the crisis millions of people are still without basics. If relief operations stop, it could lead to an unimaginable catastrophe," said Oxfam Pakistan country director Neva Khan. "Health care, clean water and sanitation are needed to stem a looming public health crisis. There's an acute food shortage and many farmers will miss the winter cropping season. The agencies warn that diseases are on the rise, food stocks are running low and the lives of at least two million adults and three million children are at risk. "We had expected the situation to stabilise by now but conditions are going from bad to worse. Each day that passes puts more children at risk of contracting diseases," said Save the Children Pakistan country director David Wright. "Malnutrition levels among children under-fives are among some of our worst recorded cases. Children's immunity is very weak, and we fear winter will make the situation worse if aid is not immediately stepped up."